One of my co-workers was asked the inevitable question of “What do you do?” at a recent party. Her response, “I regulate the disposal of low-level radioactive waste for the Nuclear Regulatory Commission,” raised some eyebrows. The reaction was not because anyone found her line of work questionable. Instead, it was a result of not knowing what low-level waste is, or how it is generated. My co-worker quickly jumped in to explain that while the term low-level waste may sound self-explanatory, it is not that clear, technically-speaking. Low-level waste is a somewhat generic term that captures everything that does not fit into other waste type definitions. So, to understand what low-level waste is, you first have to understand what it is not. It is not mill tailings, which are a byproduct of uranium milling and contain several naturally-occurring radioactive elements as well as heavy metals. It is not transuranic waste, which has its own definition based on chemistry. Finally, it is not high-level waste, which is a result of the reactions in a nuclear reactor or reprocessing fuel that has been in a reactor. Basically, low-level waste is everything else. It is created through the operation of nuclear plants, the conversion, enrichment and manufacturing of fuel, the use of radioactive isotopes in hospitals or industry, and the decommissioning of shut-down plants. It can consist of clothing, wiping rags, mops, filters, reactor water treatment residues, equipment and tools, luminous dials, medical tubes, swabs, injection needles, syringes, and laboratory animal carcasses and tissues. What may surprise people is that the radioactivity of low-level waste can span a wide range depending upon the types of waste involved. 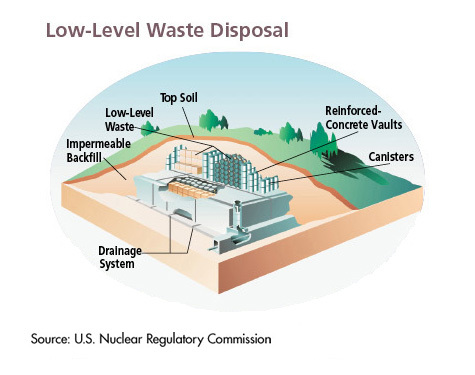 In other words, while most low-level waste is lower in radioactivity than high-level waste, this is not always true. You need to keep in mind that there are many different types of material with a large range of radioactivity that could be called low-level waste. Low-Level Radioactive Waste? this is what that means, I do not understand? Correct… classification of radioactive waste in the US is not according to the level of activity, as with the rest of the world, but rather from the source of the waste.